IMGInternational Commerce Co, is a professional company located in Pennsylvania, USA, we have been serving the transportation needs since 2002. Our company is dedicated to sell and export new and used container chassis and other transportation equipment. We sell new chassis, used chassis in as is condition, or used chassis already refurbished. We are an Authorized Dealer for brand new chassis made by CHEETAH CHASSIS in USA. Cheetah is the biggest manufacturer of chassis in USA. We are also a Dealer for STRICK Trailers (for new Dry Vans and Dollies) and EVANS Trailers (for new Flatbeds and Lowboys). We have in inventory used chassis from various manufactures like Strick, Cheetah, Hyundai, Monon, Stoughton, Manac, Loadcraft, Dorsey, Wabash, Bertolini, Ajax, etc. 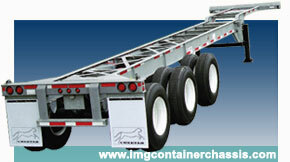 Container chassis are trailers to haul 20’, 40’, 45’, 48’ or 53’ foot containers, we sell all kind of chassis such as 20’ foot chassis, 40’ foot chassis, extendable 20’-40’ foot chassis, extendable 40’-45’-48’-53’ foot chassis, combo 8 pins chassis, ISO tank chassis, two axle chassis or tri axle chassis. Our Inventory is not limited to chassis, we also sell, used and new converter dollies, either single axle or two axle dollies. Used Gen sets also called gensets made by Carrier, Taylor or Thermo King. We sell new and used Flatbeds, new Lowboys, new and used Dry Vans, used refrigerated trailers, axles, tandems and other intermodal equipment. Do not buy from re-sellers; buy directly from us, the wholesalers. Before buying somewhere else, please check our inventory. Bilingual and professional customer service personnel will be glad to assist you with all questions and quotes. We will provide you with all information you may need. A combination of personalized service, high competitive pricing and on time shipments or deliveries is the key of IMG International Commerce’s success. Why do we offer lower pricing than our competitors? Wholesale is our business; we buy big lots of container chassis from shipping companies, transportation companies, authorized distributors, etc. The annual volume of purchase is high, so we are able to obtain pricing that will not be accessible to individual buyers or foreign buyers. Mission: To become the “number one” seller and exporter of container chassis and intermodal equipment in USA, to create and maintain long-term commercial relationships with all customers based on our professionalism and honesty in conducting business. IMG International Commerce Co, is serving customers located in USA and all over the world, we export chassis to Dominican Republic, Puerto Rico, Bahamas, all Caribbean Islands, Mexico, Costa Rica, Guatemala, Honduras, Nicaragua, Panama, Venezuela, Colombia, Ecuador, Peru, Chile, Bolivia, Uruguay, Paraguay, Angola, Nigeria, Cotte D’Ivory, Kenya, Rusia, Canada, Cambodia, etc. We would like to have you as our customer.